While many film makers love making movies about World War II, few seem to tackle the equally sobering topic of the new reality after the war is over. What happened to the soldiers? Where did the country move from that point? Did the people who fight on the winning sides feel like they actually won? 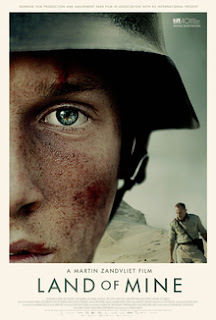 In “Land of Mine” we follow a bitter general who is given the task of monitoring captured German soldiers who are to dig up land mines that were buried on the beach. Germany felt there would be a huge battle to be fought on Dutch soil and put millions of land mines there, but left them there when it was time to get out of the country. The Dutch, not too impressed with being left millions of buried weapons, decided to simply use the prisoners they had as the means to dig up and defuse the bombs that have been buried. Most of the soldiers that have been captured are mere kids though, some not even twenty. They were recruited as early as they could, thrown into a battle they were not emotionally ready for, and got captured. Now they are prisoners and must put their lives on the line for a job that grows more and more dangerous with each bomb that is defused. This is a great setup because I would argue this is more intense than most war movies you are going to see where there are actual battles going on. Yes, there aren’t any gun shots or airplanes flying above, but there is an unspeakable tension as you watch people walk and crawl along sand on the beach, knowing that one wrong step could be the end of any of them. If that isn’t bad enough, there are kids who play near the beach, which raises the urgency of getting rid of them. The fear in the boys are real as they prove, through this painful exercise, just how unprepared for the war they were. 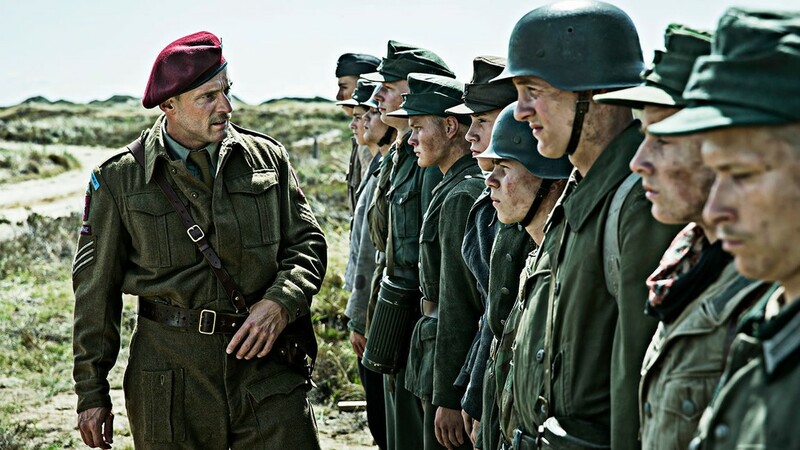 Even the general who hates the German’s is forced to look at these soldiers not as prisoners, but as young boys who got sucked into an adult problem they were not ready for and still cannot completely comprehend. The general hates German’s and views them as scum. When the film opens, he takes pride when he randomly beats a German soldier who is leaving the country along with his comrades. The scene is brutal and sad, but there is so much emotion behind you cannot help but wonder what it is the general lost during the war that made him lash out so much. It is a reminder that even when the fighting stops the healing needs to begin. The only family the general seems to have is his dog. He is also very protective of a woman and her daughter who live in the beach house the prisoners are trying to clean up, so there are some hints that he may have lost a family during at some point. His interactions with the boys are fascinating to watch as we witness a man go from viewing them as the scum of the Earth to actual human beings. In the case of one of the boys, you sense he even starts to view him as someone who could have been his own son in another lifetime. There are millions of stories to tell of the war. Most of the ones we hear involve the soldiers on the battlefield. 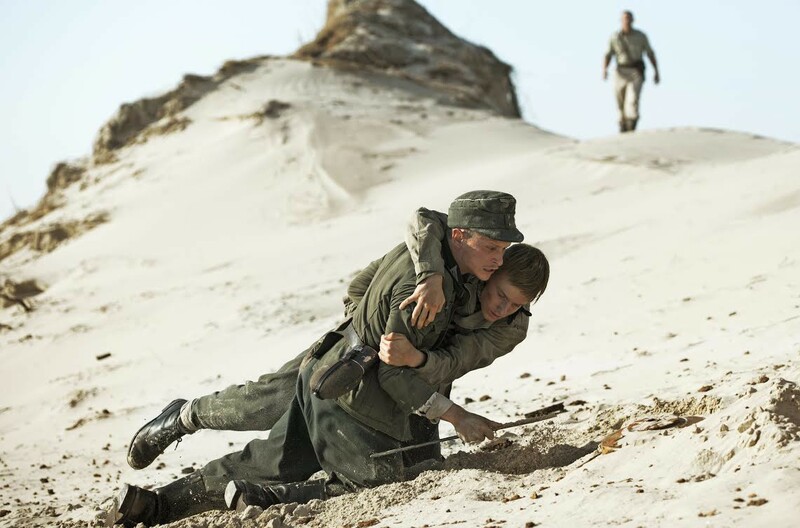 “Land of Mine” shows that there is gold to be found in the human stories of those who had to deal with the war from afar or after the fact. Those are the kinds of stories cinema could benefit from, and hopefully this will be the film to get the ball rolling on getting them made. 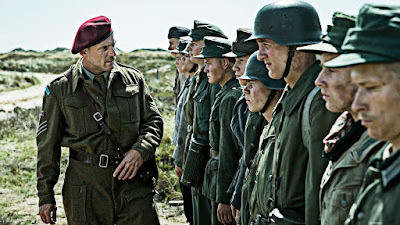 Parents, there is some strong violence, language, and a scene where Dutch soldiers piss on German soldiers (literally). Recommended for ages 17 and up.